—KAOS, Donkey Kong Country 3: Dixie Kong's Double Trouble! 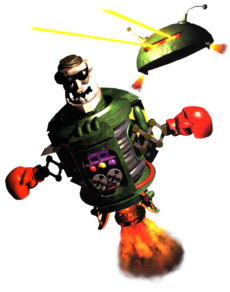 KAOS is a large, rocket-propelled robot and the apparent master of the Kremling Krew; he is a boss encountered during the events of Donkey Kong Country 3: Dixie Kong's Double Trouble!, and is the game's secondary antagonist. In Donkey Kong Country 3: Dixie Kong's Double Trouble!, KAOS is first encountered by Dixie Kong and her cousin Kiddy Kong while venturing through the factory covered island Mekanos. Entering a factory titled KAOS Karnage, the Kongs watch as KAOS descends downward upon them. Immediately identifying the Kongs as a threat, KAOS engages them in battle. Although he attempts to roast the Kongs with his exhaust flames, this ploy fails as the Kongs can simply weave and run underneath KAOS. Changing tactics, KAOS begins to use spinning blades in an attempt to attack the Kongs. However, this backfires as the Kongs can simply hop on top of the blades to reach and stomp on KAOS's head. They must act quickly, however, or a robotic arm with a punching glove on the end will extend from KAOS's body and knock them off. After enough stomps, KAOS's head floats off his body, revealing a second head underneath. This head looks like a skull wearing sunglasses. Once again KAOS changes his strategy, this time his floating head swoops down and attempts to blast the Kongs with its laser vision. After dodging the laser blasts from KAOS's flying head, his body descends and the Kongs can once again scale KAOS's rotating blades and jump on his head. After jumping on the head several more times, KAOS's flying head falls to the ground and explode. The body, realizing it has been defeated, flees, but not before dropping a Ski that the Kongs can give to Funky at Funky's Rentals. Dixie and Kiddy later re-encounter KAOS in Kastle KAOS in Donkey Kong Country 3's last area KAOS Kore. When the Kongs enter Kastle KAOS, KAOS descends to engage in battle against them. The Kongs managed to bash KAOS's head, using barrels this time. After this attack KAOS's head rockets out of his body and a third, cylindrical, black head rises from KAOS's body. This new head attempts to defeat the Kongs using a bomb-launcher hidden inside a hole on top of his head. Dodging this new head's barrage of explosives, the Kongs manage to once again bash KAOS's head with barrels. After this attack, KAOS's head spins then retreats back in his body, shutting down, and falls to the ground. Suddenly, a crane hook descends and lifts KAOS's body into the air. After this display, a curtain nearby opens, which reveals the Kong's old enemy, King K. Rool, now under the guise of Baron K. Roolenstein. K. Rool reveals to the Kongs that he built KAOS out of his wife's pots and pans, as a puppet leader to the Kremling Krew, with him as the puppeteer. K. Rool then engages Dixie and Kiddy in battle. After a long fight the Kongs managed to defeat K. Rool. When the crocodilian tyrant is sent flying, KAOS descends from the ceiling. Suddenly the missing Donkey Kong and Diddy Kong climb out of KAOS's body. It is revealed that K. Rool abducted these two in order to utilize their cerebral energy to power KAOS. In the GBA version, KAOS cannot be fought in Kastle KAOS again, unlike in the SNES version; instead the Kongs immediately fight K. Rool. In Donkey Kong Land III, KAOS returns as the boss of Great Ape Lakes. He is fought in a tiny factory, and his boss level is entitled Krazy KAOS. It is assumed that K. Rool found an alternate power source for KAOS, as this time he is no longer powered by Donkey Kong or Diddy Kong. During battle, KAOS will fly back and fourth through the stage. As he does this, Kiddy Kong and Dixie Kong must jump over him, without getting hit. Soon, KAOS will move to the top-middle of the screen, and the Kongs must jump on the platforms that come out of his sides to get to his head. After the Kongs jump on him a few times, the robot will fall down, and disappear for the rest of the game. In Dixie Kong's Photo Album. This page was last edited on March 15, 2019, at 12:41.